The weather is warming up, the kids are getting out of class, and the pools are opening. It’s starting to look a lot like summer. That can only mean one thing: it’s officially grilling season. Unfortunately, as the barbeques grow in size and quantity, so too can the price tag. 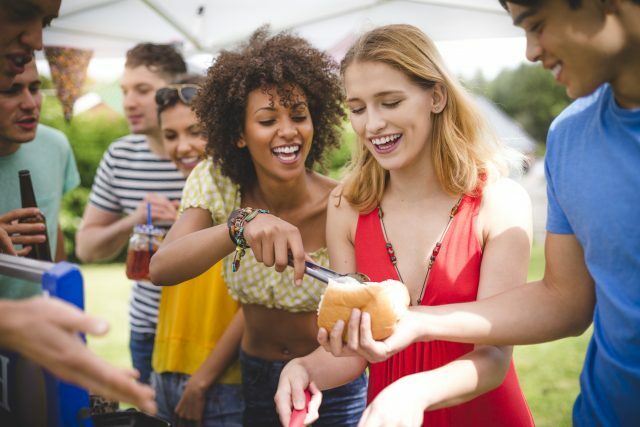 To help throw an amazing barbeque sans high costs, we’ve collected some insider tips to make your dollar go further. Grab your best grilling apron, as we guide you to have that perfect summer BBQ on a budget. The easiest way to cut your BBQ grocery list by 25 percent or more is choosing generic store brands over name brands. While we are trained to recognize and choose brand names, store brand alternatives often are comparable or even better than their counterparts. When you buy name brand you are paying a premium to supplement advertising and distribution costs, but store brand alternatives often have little overhead or marketing costs, keeping their prices low. Don’t Splurge on Fancy Meats. It is certainly tempting to throw ribeye steaks and chicken breasts on the grill, but if you’re budget conscious you can use skirt steak or chicken legs to offset cost. Thekitchn.com ranked chicken cuts from least to most expensive and unsurprisingly whole chicken breast came in as the most expensive option. If you’re sticking to burgers, you can buy ground beef or chicken in bulk and prep the patties yourself to cut costs. Cut big $ with DIY Rubs and Spices. Don’t let fancy store sauces cut into your BBQ budget when you can make flavorful rubs and spices at home for a fraction of the cost. Rubs require minimal effort and can often be created from spices you already have at home. A simple collective of salt, pepper, paprika, and onion powder makes a great simple rub for chicken, fish, and steak. You can find homemade dry rub recipes here. As for sauces, if you have ketchup, vinegar or soy sauce at home then you are set to make a savory marinade. For further savings, you can host a BYO-Sauce themed BBQ and have guests vote on their favorite sauces. While at the grocery store opt for whole Roma tomatoes, onions, avocados, and limes instead of buying premade salsas and guacamole. With a couple dollars and some elbow grease, you can make a flavorful guacamole that will impress your friends and keep your bank account in the black. Inspiredtaste.net offers an easy homemade guacamole and salsa recipe to guide you. Don’t let typical bbq sides constrain your creativity. Don’t like salsa? Make a homemade hummus instead. Have a knack for gazpacho? Don’t be afraid to test it on your guests. Despite Ron Swanson’s opinions, you can have a flavorful and fun BBQ without meat. A portabella mushroom and corn on the cob will significantly reduce your grocery store costs and provide a twist on the common BBQ. Summer squashes, zucchini, and bell peppers can be used to make veggie kabobs or add flare to a veggie or mushroom “burger.” With all of the vitamins in colorful vegetables you’ll also be able to keep your immune system in hyper drive, avoiding any unfortunate colds that could sideline your summer grilling adventures.